Sqn. Ldr. Lawrence “Benny” Goodman (617 Sqn) who volunteered for aircrew at 18 years of age and was called up in 1940. After basic training he went to RAF Abingdon – a Whitley O.T.U – for what he was told would be ‘straight through’ training. This did not materialise and he found himself in the role of a Ground Gunner. In 1941, a posting eventually came through to the Initial Training Wing followed by Elementary Flying School at Peterborough and an instructor’s course at Woodley, Reading; then to Clyffe Pyparde, a holding unit. A sea journey to Canada followed and Service Flying Training School on Ansons. On completion he was posted to Kingston, Ontario, to instruct Acting Leading Naval Airmen on the Royal Navy tactics of the time. e.g. jinking after take off, dive bombing etc. “However, I had to learn everything first, so I was just about one step ahead of the students!” said Benny. Eventually returning to the UK and O.T.U. on Wellingtons at Silverstone and Heavy Conversion Bomber Unit at Swinderby on Stirlings. Then a short course at the Lancaster Conversion Unit. After an interview Benny and his crew were surprised and delighted to find they had been selected for 617 Squadron – this was in 1944 and they stayed together as a crew on 617 Squadron until the war in Europe ended. He completed 30 missions – all with William “Jock” Burnett as his flight engineer. 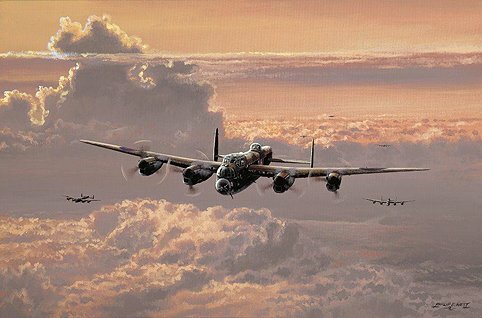 Notable raids Benny took part in were on the Tirpitz (29/10/44), dropping the Grand Slam 22,000 bomb on the Arnsberg Viaduct (19/03/45) and the attack on Berchtesgarten ‘Eagles nest’ (25/05/45). Flt Lt Russell (Rusty) Waughman DFC, AFC, (Special Duties Lancaster pilot) volunteered for the RAF in 1941. After training in Canada, he qualified as a heavy bomber pilot. In November 1943 he was posted to No 101(Special Duties) Squadron at Ludford Magna. He completed a tour of operations, which began during the ‘Battle of Berlin’, where they did several operations. Surviving a mid-air collision, only to write the aircraft off on landing, ‘Rusty’ and his crew on a subsequent flight had a miraculous escape when their aircraft was blown upside down, over the target, at Mailly-le-Camp; they also survived the Nuremberg raid on 30th March 1944, when 97 aircraft were lost – including about one quarter of 101 sqn strength that night. Flt. Lt. Ronald Homes DFC (Special Duties Lancaster pilot) joined the RAF in March 1942 and after initial training, went to Terrell, Texas, USA for his flying training, where he gained his wings in May 1943. He returned to the UK and joined No. 101 Sqdn. in May 1944, going on to complete 32 Ops. over Europe. After his bombing tour he converted onto Dakotas, joined No. 238 Sqdn. and flew out to India and Burma, then on to Australia and the South Pacific. After the Japanese surrender he joined 1315 Flight and flew up to Japan with the occupation forces. Flt. Lt. Phil Ainley DFC (Pilot) Phil was 15 when war was declared on the 3rd September 1939. He had always wanted to be a pilot and the only way to do this was to join the RAF or the RAF Volunteer Reserve. However, he couldn’t join until he was 17 and so he took up an engineering apprenticeship. When Phil tried to join up again he was told he couldn’t because he was in a reserved occupation. Phil finally joined the RAF in November 1941 when he opted for aircrew as this was the only way he could get out of his apprenticeship. However, he couldn’t start his flying training until he was 17½. Phil’s first operational flight with his crew was on the 24th May. Their target was the marshalling yards in Antwerp. Things were building up for the D Day landings and so the aim of the bombing raids was to cause maximum disruption to the Germans. Although the crew were not told when D Day was to happen, they returned from a mission in the early morning on the 4th June and saw numerous ships and barges, so they knew something was occurring. By July, Phil and his crew had flown 14 missions and they were flying almost every other night. After the troops had been landed in France there were more trips into Germany and more aircraft went missing. In the summer of 1944, Phil’s logbook recorded two trips, one with 31 missing and one with 49 missing and each of those aircraft had a crew of 7 men. On the 16th August 1944 the crew were briefed to do a ‘gardening’ mission. Gardening was code for dropping sea mines. The area to be mined was the Stettin Bay Canal in Germany. The mines had to be dropped from only 250 feet and this area was fiercely guarded. Only 6 crews had been detailed to fly down the canal and Phil’s was one of them. Command had laid on an attack on the town of Stettin itself to draw attention away from the Canal. However, the bombing was delayed as the marking for the bombs was off track and the aircraft had the terrifying prospect of orbiting the target at only 250 feet, whilst marking was relaid. The aircraft in front of Phil was blown up and they had to negotiate the debris. Out of the 6 aircraft earmarked to bomb the Stettin Canal, one was blown up, one did not reach Stettin and one went missing. It was for this mission and pressing home the attack that Phil was awarded the Distinguished Flying Cross. Having successfully completed 33 missions Phil and his crew left the Squadron on the 6th October. In 2002, after 58 years Phil was re-united with his Navigator at a Re-union at East Kirkby, the Station from where they flew during the war. Flt. Lt. Ken Fillingham DFC (Special Duties Lancaster pilot) joined the RAF in May 1941, eventually joining 101 Special Duties Squadron as a Lancaster pilot in February 1944. Ken took part in many memorable raids, including Stuttgart and Nuremburg. On a raid to Mailly-Le-Camp he credits his Special Duties Officer with having saved the aircraft by alerting Ken to a fast approaching German fighter. Flt. Lt. Ronald Clark DFC (Pilot) volunteered for flying duties in 1941 and after interviews completed initial training in Paignton. A flying grading course followed at Kingstown near Carlisle surprisingly near my family, before being sent as “Ambassadors” for Britain across the Atlantic to be trained by the USAAF. After more initial training to learn the American way, not a bad way, we embarked on the flying training and after receiving the silver wings, the next port of call was Bournemouth in a hotel which shortly afterwards was demolished by the Luftwaffe. Several courses preceded our arrival at Lindholme heavy conversion unit before joining the “Battle of the Ruhr” with No 100 Squadron based at Waltham near Grimsby. My crew and I were assigned a brand new Lancaster III EE139 which we almost did for on our twenty-fourth trip with her to Manheim, but she went on to complete 120 operations before being unceremoniously scrapped. Little did we think that over 60 years later she would be “recalled to life” by the Battle of Britain Memorial Flight. After a period of instructing I was then posted to No 7 Sqdn for deployment to the Far East, which was stymied by the dropping of the atomic bomb, I did a lot more instructing before applying for a secondment to BOAC. (Publishers note: A very modest potted biography by Ron! I highly recommend a visit to this web site where you will find a lot more information about Ron’s flying career.